Astronomers find multiple images of a "standard candle" in the sky, leading the way to more precise measurements of the expansion rate of our universe. An international team of astronomers has, for the first time, seen a strong cosmic magnification and multiple images of a Type Ia supernova. This class of supernovae — often referred to as "standard candles" because of their well-known intrinsic brightness — are frequently used by astronomers to accurately measure the expansion rate of our universe, as well as the amount of dark energy, which is thought to be accelerating this expansion. Finding a magnified, or "gravitationally lensed," Type Ia supernova is like discovering a brighter candle with which to view the universe. The researchers say this discovery is the first of many to come, and that having a whole collection of similarly lensed Type Ia supernovas will lead to more precise measurements of our universe's most fundamental traits. Gravitational lensing occurs when the gravity of a cosmic object, such as a galaxy, bends and magnifies the light of a more distant object. The effect can cause galaxies to appear strangely twisted, and even produce multiple images of the same object. While this phenomenon of gravitational lensing has been observed many times since the early 20th century, when it first was predicted by Albert Einstein, imaging a lensed Type Ia supernova has proven formidably difficult, until now. 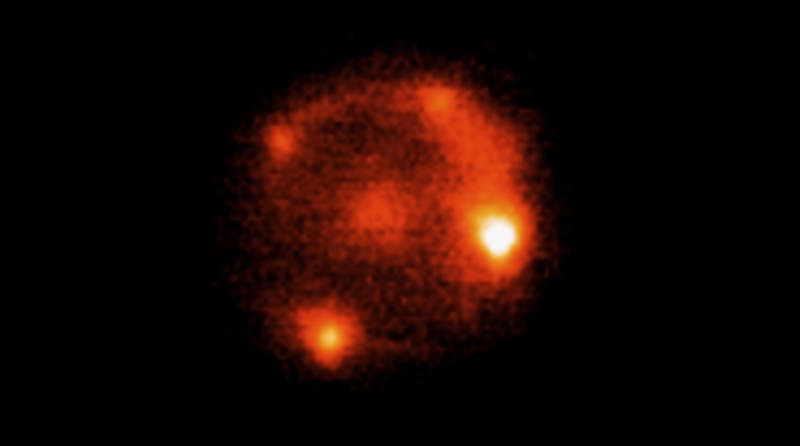 In the new study, published April 21 in the journal Science, the researchers imaged the Type Ia supernova called iPTF16geu and found it duplicated into four different images. "Resolving, for the first time, multiple images of a strongly lensed 'standard candle' supernova is a major breakthrough," says Ariel Goobar, a professor with the Oskar Klein Centre at the University of Stockholm, Sweden, and a lead author of the study. "Normally, when we view a lensed object, we don't know the intrinsic brightness of that object, but with Type Ia supernova, we do. This will allow us to better quantify and understand the phenomenon of gravitational lensing." Goobar and his group are partners in two Caltech-led international scientific collaborations— the intermediate Palomar Transient Factory (iPTF) and the Global Relay of Observatories Watching Transients Happen (GROWTH) project. 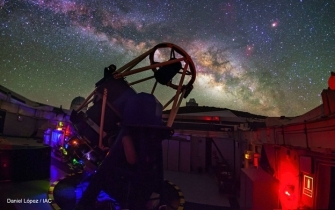 The iPTF takes advantage of the Palomar Observatory and its unique capabilities to scan the skies and discover, in near real-time, fast-changing cosmic events such as supernovas. GROWTH manages a global network of researchers and telescopes that can swiftly perform follow-up observations to study these transient events in detail. "I was baffled when I saw the initial data for iPTF16geu from the Palomar Observatory. It looked like a normal Type Ia supernova but it was much brighter than it should have been given its distance from us. The rapid follow up with more powerful facilities confirmed that we had stumbled upon an extremely interesting and rare event," says co-author Mansi Kasliwal (MS '07, PhD '11), the principal investigator of GROWTH and an assistant professor of astronomy at Caltech. Within two months of detection, the team observed the iPTF16geu supernova with the NASA/ESA Hubble Space Telescope; the adaptive-optics instruments on the W.M. Keck Observatory atop Mauna Kea, Hawaii; and the VLT telescopes in Chile. Apart from producing a striking visual effect, capturing the image of a strongly lensed Type Ia supernova such as iPTF16geu is extremely useful scientifically. Astronomers can measure very accurately how much time it takes for the light from each of the multiple images of the supernova to reach us. The difference in the time of arrival can then be used to estimate with a high precision the expansion rate of the universe, known as the Hubble Constant. Another unique advantage of lensed Type Ia supernovas is that they can be identified with relatively small telescopes, such as the 48-inch Samuel Oschin Telescope at Palomar Observatory, which was used to image the iPTF16geu supernova. Larger telescopes are in high demand, and equipped with narrow-field cameras that take too much time to routinely scan the sky. The iPTF project scanned one-fifteenth of the visible sky every night. Its successor, the Zwicky Transient Facility (ZTF), set to begin observing this summer, will scan the skies even faster, and is capable of covering the entire accessible sky every night. By scanning large swaths of the sky, astronomers can sift through thousands of cosmic objects to find rare events such as the lensing of a Type Ia supernova. "I am blown away. When iPTF was conceived, we only dreamed of discovering such events. We knew they existed but we honestly did not expect to detect one! It bodes well for the iPTF's successor, ZTF," says Shri Kulkarni, John D. and Catherine T. MacArthur Professor of Astronomy and Planetary Science, who is the principal investigator of ZTF as well as director of the Caltech Optical Observatories. "What's more, while ZTF is 10 times faster than iPTF, new facilities such as the national flagship Large Synoptic Survey Telescope (LSST) are 10 times faster than ZTF. Clearly, the discovery of iPTF16geu suggests a wealth of new science that will be made possible with the LSST," adds Kulkarni. The study of iPTF16geu is already delivering interesting results. Using data from Keck and Hubble the team calculated that the lensing matter in the galaxy magnifying iPTF16geu has a mass up to 10 billion times that of the sun and a radius of nearly 3,000 light-years. Compared to other lensing objects, this is relatively tiny. Studies of unusual lensed objects like this give astronomers a new peek into gravitational lensing and may redefine what we know about the factors, such as dark matter and Einstein's general theory of relativity, that contribute to lensing. "The discovery of iPTF16geu is truly like finding a somewhat weird needle in a haystack. It reveals to us a bit more about the universe, but mostly triggers a wealth of new scientific questions. That's why I love science and astronomy,"says Rahman Amanullah, a research scientist at Stockholm University and a coauthor on the study. The Science study is titled, "iPTF16geu: A multiply-imaged gravitationally lensed Type Ia supernova." Other Caltech authors include Chuck Steidel (PhD '90), Lee A. DuBridge Professor of Astronomy; postdoctoral scholars Nadia Blagorodnova, Thomas Kupfer, and Ragnhild Lunnan; Frank Masci, IPAC scientific research/task lead; Research Scientist Don Neill; Vikram Ravi, R A and G B Millikan Postdoctoral Scholar in Astronomy; Richard Walters, assistant research engineer for Palomar; and IPAC Staff Scientist Lin Yan (PhD '96). The intermediate Palomar Transient Factory (iPTF) is based at the Palomar Observatory, operated by Caltech. The iPTF project is a scientific collaboration among Caltech; Los Alamos National Laboratory; the University of Wisconsin, Milwaukee; the Oskar Klein Centre; the Weizmann Institute of Science in Israel; the TANGO Program of the University System of Taiwan; and the Kavli Institute for the Physics and Mathematics of the Universe at the University of Tokyo. GROWTH is a partnership of 14 international academic institutions that jointly pursue science at the frontier of time-domain astronomy. GROWTH is jointly funded by the National Science Foundation (Partnership for International Research and Education program) and partners in Japan, Taiwan, and India. The W.M. Keck Observatory is a scientific partnership of Caltech, the University of California, and NASA.